A constant content flow that has the power to keep you and your brand in the public eye is an invaluable asset. Nonetheless, the process of creating fresh, reader-oriented, 100% original content for different social platforms demands a lot of time and money. Successful content and social media marketing require the highest level of commitment and consistency, whereas you, as a budget-conscious small business owner, have the responsibility to manage your resources wisely and limit your spending without making any quality compromises. This is where content curation comes into play, allowing you to increase your social popularity and online visibility without breaking the bank. What Is Content Curation and How Could It Help Me Grow My Business? Content curation refers to the act of identifying, collecting, organizing and sharing content that is relevant to a certain area of interest and a particular audience. You may be wondering: how could this strategy benefit my business? Truth be told, there are several benefits associated with content curation. First of all, this technique enables you to save time, money and energy that you would otherwise have to invest in content creation. Secondly, the almost overwhelming abundance of premium content launched by reputable sources allows you to select the best pieces based on the interests and expectations of your audience, and also according to your own mission, vision and goals. Thirdly, content curation is a social act by definition; therefore, it could represent a viable and extremely effective method to establish new partnerships with prominent players operating in your industry, make new contacts and rely on the type of writing that can give you the chance to reach a larger segment of public. Content Creation vs. Content Curation: Which Tactic Works Best for Your Business? An article published by Social Media Today reveals that both content curation and content creation are excellent methods that any company can use to fill its content pipeline. However both processes have their pros and cons and should be seen as the two halves of the same whole; not as two disparate strategies implemented to achieve a steady content flow. 1. Cost-Efficiency. When you have sharable, world-class content at your fingertips, you can choose to curate your favorite pieces instead of crafting new ones from scratch. 2. Time-Efficiency. When you don’t have much time to create your own content, you can promote the most brilliant ideas introduced by reputable industry experts to give your readers the food for thought that they’re expecting to see on your blog/website/social media account. 3. The Chance to Build and Maintain New Connections. By consuming other people’s web content, you encourage the development of new potentially fruitful partnerships that could support your boldest marketing goals in the future. 4. The Opportunity to Help Your Readers Explore Various Perspectives on a Certain Topic. Content curation lets you introduce newsworthy facts from multiple perspectives, enabling your readers to form an educated opinion on a particular subject. On the other hand, content creation also has its fair share of benefits, including the following ones. 1. The Opportunity to Make Your Voice Heard Through Original Content. Your tone of voice, the originality of your ideas and the way in which you bond with your readers and encourage their feedback are the main elements that reflect your uniqueness. Through content creation you can celebrate your individuality and make sure that you’re not at risk of drowning in a sea of copycats. 2. The Ability to Demonstrate Your Skills and Knowledge, While Consolidating Your Position on Your Niche. Unique, highly researched content helps you talk like an expert and be identified as one by your audience. 3. The Chance to Craft, Publish and Promote Quality Content That Is Exclusively Yours. Words. By creating quality content you can boost your level of exposure. First of all, world-class writing encourages visitors to land on your page over and over again; secondly, the superior quality of your content pieces may stimulate other curators to showcase your masterpieces, implicitly spreading the word about your business. 4. A Deeper Connection with More Loyal Readers. Last but not least, generally speaking a constant content flow based on original pieces could improve your relationship with your readers and boost their loyalty, who will see you as an inspired creator, as opposed to a mere curator with no voice of his own. Both curation and creation can support your everyday marketing goals, allowing you to support the growth of your small business. The key is to maintain a solid balance between the percentage of curated content and original content that you publish on your website. In an article published on SiteProNews, we have listed the main steps that one should take to guide a healthy content curation strategy in the right direction. Here are five tips that you should apply to curate content like a pro. 1. Discover the Particularities of Your Audience (Including Its Area of Interest). What kind of subjects would make your readers tick? What type of content pieces should you actually curate to stay on the same page with your readers? 2. Make Sure Content Creation Is Just a Piece of Your Content Marketing Puzzle. These days, in order to maintain your competitiveness in any industry, you have to be more than an enthusiastic curator. Perfect your content crafting skills and let the whole world hear your unique story. 3. Add Value to Each Content Piece That You Curate. Make sure every single content piece that lands on your website/social media channel bares your creative imprint. Instead of copy pasting info coming from different high-authority sources, choose to filter the facts that you present through your own perspective. 4. Do Your Research. Find the best sources that could offer you the most relevant and engaging type of writing for your content curation strategy. 5. Use the Right Tools to Take Your Content Curation to the Next Level. Now you can make the most of an ample series of free and almost free curation tools, such as Curata, Scoop.it, Bundle Post and Storify, designed to discover, organize and share relevant, engaging content coming from trustworthy sources. You are the content pieces that you distribute through different channels, so what do your posts actually say about you and your business? Moreover, what kind of favors should you expect from the content that you choose to publish on your website, blog and/or social media platforms? According to an article signed by Convince&Convert, you can measure the effectiveness of original content vs. curated content by taking a closer look at conversion rates and click rates. According to the data provided by this source, posts linking to third-party websites ensure up to 33% more clicks than the ones linking to owned websites. In other words, curation leaves content creation behind when it comes to counting clicks. Nonetheless, content creation appears to be the optimal strategy that you should employ if your goal is to drive conversions. Convince&Convert reveals that for posts linking to your website the click-to-conversion rate is up to 54% higher than the one displayed by posts linking to third-party websites. If you take a minute to think about it, this actually makes sense: your prospects need at least one good reason to become your clients. In this case, your original content is the main motive that stimulates them to make a purchase and interact with your brand in different ways (subscribe to your newsletter, provide feedback, share your content on social networking websites and so on). 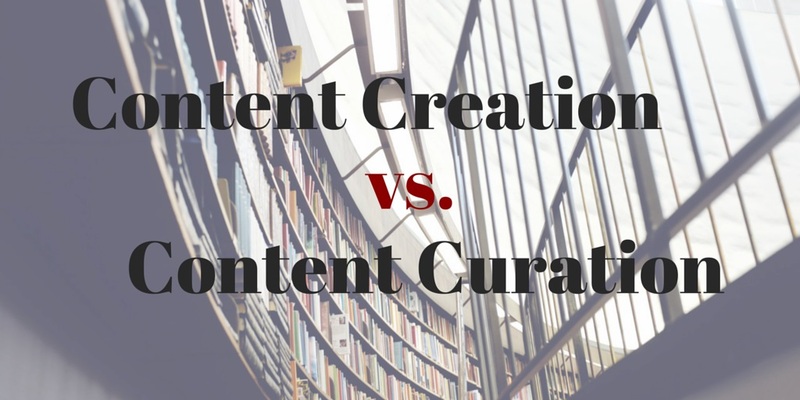 All in all, why choose between content curation and content creation when you can have both? Learn to see curated content as a breath of fresh air; turn it into your valuable source of inspiration and use it as a solid foundation for your upcoming content crafting efforts. Convince&Convert sheds some light on the secret recipe for success based on curation and creation: people who link their posts to their website anywhere from 25% to 50% of the time, get the best results. However, this range may not always serve your best interest. A trial-and-error process is the best way to establish the optimal ratio between curated and original content. Measure your very own curation/creation efforts regularly and find out what type of content actually encourages your readers to respond to your calls to action in the most desirable manner.